Dissidents in Turkey’s nationalist opposition accused the government on Saturday of interfering in an internal party dispute that could end up jeopardising President Tayyip Erdogan’s plans for more power. Several hundred members of the Nationalist Movement Party (MHP) have launched a bid to oust Devlet Bahceli, leader for much of the last two decades, and to do so they need to change party rules at a special congress they want to hold on Sunday. Four leaders of the revolt, including former interior minister Meral Aksener, issued a statement accusing Erdogan’s AK Party of intervening to try to block the special congress. Bahceli’s faction sought an injunction to block the meeting but an Ankara court upheld the dissidents’ countersuit. Only minutes later, state-broadcaster TRT reported verdicts from two other local courts that would halt the congress. The MHP‘s dispute could be crucial for Erdogan because he needs its help to amend the constitution and give him more power. Dissident leader Aksener opposes that and polls say she could double support forMHP if she ousts Bahceli. The AKP has increased its influence over the courts in recent years and its opponents say the legal chaos surrounding the congress results from its efforts to keep Bahceli in power. “This is a direct intervention from the AK Party and government to the MHP congress and it is unacceptable,” the dissidents said in a statement. They added that they would turn up at the hotel where the congress was scheduled to take place on Sunday. 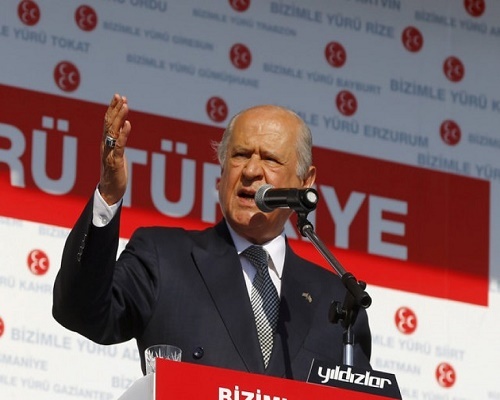 Bahceli has led the MHP for much of the last two decades. His party won about 12 per cent of the general election last November, getting 40 seats in parliament whose votes the AKP needs to call a referendum to amend the constitution. Bahceli loyalists seem willing to do this, but Aksener, a former interior minister, has vowed she would defend Turkey’s current parliamentary system and oppose Erdogan’s plan. AKP officials reject any suggestions that the government or ruling party is influencing the courts, or that theMHP‘s leadership battle and AKP efforts to win its support on constitutional change are in any way linked.